Where did I spend the best night of my entire summer? Ridgeback Lodge is a secluded glamping destination in New Brunswick. 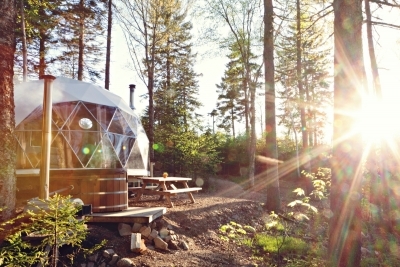 Their cabins and domes are crazy luxurious, magical and open all year round. Here's how my visit played out. Forget Banff National Park! When it comes to camping in the Canadian Rockies, Canmore ought to be on your radar. Here's all you need to know about Canmore and Kananaskis campgrounds. Tent haters: I feel your pain. Trailers are a major investment and hotels ain't cheap. Fret not! I found 10 fantastic options for comfort camping AKA glamping across Alberta.